Circadian biology had long been overshadowed by other sub-disciplines in the biological sciences. But when Susan Golden was named a Howard Hughes Medical Institute (HHMI) professor in 2014, she launched the UC San Diego BioClock Studio to promote and educate students about circadian biology. Three years later, the BioClock Studio has developed into an innovative program composed of undergraduate students across diverse disciplines and backgrounds who work collaboratively with UC San Diego’s Center for Circadian Biology research faculty and staff. Their mission is to enhance scientific understanding among students, the general public, clinicians and researchers outside of circadian biology. 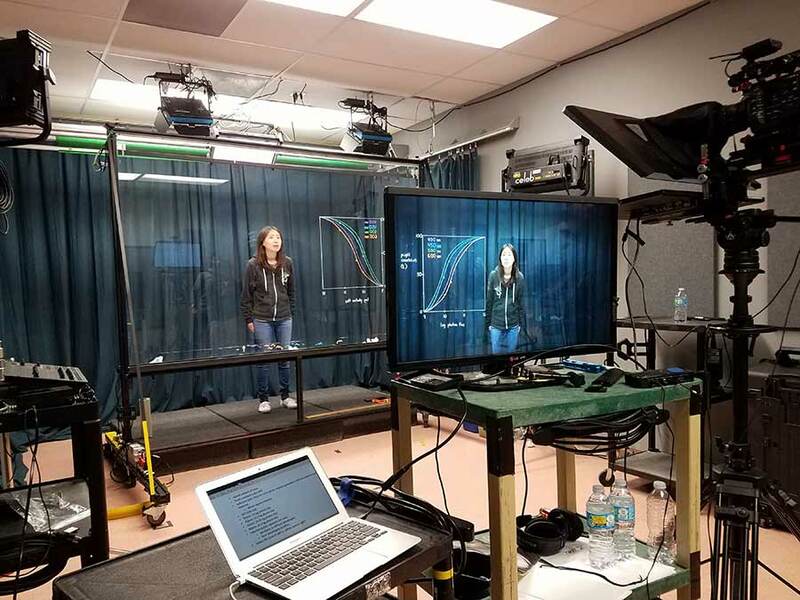 BioClock Studio’s Waverly Tseng uses Learning Glass technology at EdTech to draw a chart as supplemental material for UC San Diego’s circadian rhythm undergraduate course. Photo Courtesy BioClock Studio. The course material created from the BioClock Studio each winter quarter is integrated into the syllabus for a specialized circadian rhythms undergraduate course offered exclusively in the fall quarter. More than 250 students enroll in the clocks course each year. Paul Llanura is a graphic design student and one of the undergraduate students in the 2017 BioClock Studio cohort. “I think that creating educational materials is a good opportunity to learn about applying the arts to scientific research, and I hope to create something that has a beneficial impact to students,” he said. Outside of traditional text and slide deck presentations, the BioClock Studio creates multimedia pieces, interactive videos and creative graphics to aid in learning about aspects of circadian biology in academia and for the general public. Besides its relatively specialized nature, the Center for Circadian Biology stands apart from centers at other universities because of the sheer breadth of research that is represented here in the general area of circadian biology. Circadian research covers everything from human sleep disorders and metabolic problems caused by shift work and jet lag, to understanding the way microorganisms such as bacteria regulate their internal biological clocks. Golden’s research in cyanobacteria focuses on how cells synchronize their clocks with the environmental cycle and how they are impacted for better or worse when conditions are optimal or otherwise. Beyond the campus walls, BioClock faculty and students’ coursework are building a massive open online course on circadian rhythms that provides additional opportunities for students and others to learn more about the impact that changes in biological clocks can have on our health and biological processes. 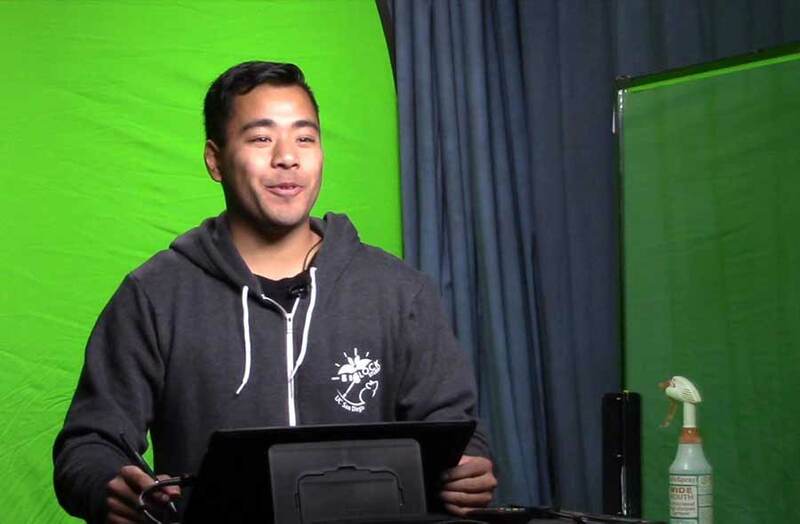 BioClock Studio’s Jared Kim presents during a video shoot to create supporting materials for a circadian rhythm undergraduate course. Photo Courtesy BioClock Studio. With the recent announcement of the 2017 Nobel Prize in Physiology or Medicine awarded to circadian biologists Jeffrey C. Hall, Michael Rosbash and Michael W. Young, the discipline is being thrust into the spotlight and inspiring interest at all levels of education. Victoriah Nudell, a master’s student completing her research thesis in circadian biology, said she was pleased to hear the news. The five-year HHMI grant, which supported the formation of the BioClock Studio and is educating the public about circadian biology on a larger scale, however, ends in two years and Golden is hoping the publicity surrounding this year’s Nobel Prize will generate interest in continuing its activities.